Made easy: You can access your PYROVIEW FDS fire detectio system with our new app at any time. The German company DIAS Infrared is one of the leading producers of modern infrared fire detection systems. PYROVIEW FDS is a flexible and expandable thermal imaging camera system for the early detection of overheating and elevated surface temperatures. The system is used especially for the storage of paper, waste or combustible materials, but also in forests and tunnels to detect and fight fires. It works usually fully automatically. If improper overheating are detected within the area to be observed, an alarm forwards the information to the responsible departments and triggers and automatic extinguishing of the fire if necessary. The system can be operated not only on site or in a control room, but also via mobile devices. By using a special app on a smartphone it is possible to access to the system and get an idea of the situation on site. In case of faults or alarms push messages or emails can be sent automatically. 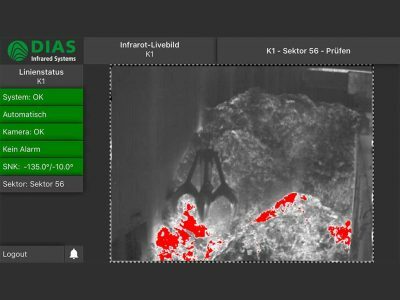 A fully equipped system meets the requirements of VdS Guideline 3189 for IR camera units for temperature monitoring in fire protection. For more information and technical details about PYROVIEW FDS – fire detection can be found here. Please contact our team if necessary and visit us at this year’s trade fair for preventive fire protection “FeuerTrutz”, 20.02.-21.02.2019 in Nuremberg, Germany, booth 10.0-626.